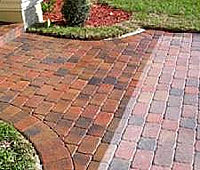 Sealing is meant to protect pavers from the elements(i.e. rain, sun etc...) and anything foreign that were to fall on them. It creates an invisible bar-rier on top of the pavers that repels water,oil,and anything else you might accidentally drop on your driveway or pool deck, so long as you wash it clean as soon as you spot it. Sealing also preserves the pavers' natural beauty for years to come. Unfortunately, sealing does not prevent ants from coming up from your lawn or weeds from sprouting up due to seeds in the air.Other products may take care of that problem for you like a good ant killer sprayed in the yard, and a sand joint stabilizer, which is a more expensive product than the regular sealer. It's usually a 2-day process (weather permitting of course). The first day, a chemical wash is done followed by pressure cleaning with a 5,000 P.S.I pressure cleaner, getting almost anything out (stubborn penetrating stains like oil and rust may not come out). The second day, given that the surface to be sealed is completely dry, a sealer is sprayed on the pavers.